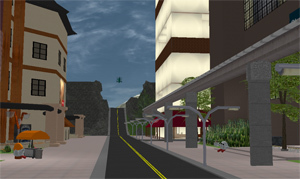 Cirrus Street is a concentrated area of commercial businesses and offices in Syntax Estates. Home to such big names as CyberCola and SynCorp, the relatively central location of the area on SW Island can be attributed to the attention of developers. Cirrus Street houses one of the highest concentration of office high rise buildings on SW Island, the largest being Stocksberge? on Sybit Island. The street is tucked along the west and north side of the Grinsdale Mountain range with Stobeck Forest? bordering it to the east. As a hub of activity, Cirrus Street and the surrounding area attracts the social scene as well. The street has been known to host city-wide block parties in it's history, as well as being home to the Cyberdome nightclub. 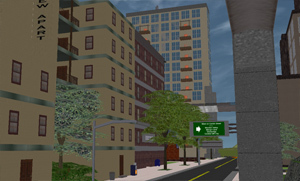 The north end of Cirrus Street is known for its low-budget housing district known as the Cirrus Slums.